“Canonicals” (ministerial vestments) are – or were – an axiomatic part of Minhag Anglia, the “Anglo-Jewish usage”. Ashkenazi ministers wore a (sometimes hexagonal) black cap akin to a biretta or Continental doctoral hat, a black gown like a Geneva preaching robe, and neck bands (which sometimes went with a clerical collar). There was a High Holyday version in white. United Synagogue bye-laws required officiants to wear robes at all services, even on weekdays, though this latter rule was dropped long ago except in older congregations such as Bayswater. Even there, wearing tefillin on weekday mornings with a cap and gown was very awkward, though some ministers loyally upheld the regulation. In Western Europe, canonicals were customary before World War II, but few communities maintain them today. Like some other German rabbis who came to the USA in the late 1930s, Rabbi Manfred E Swarsensky wrote of “a minor trauma when I had to divest myself of the Baeffchen (bands) we used to wear. That the latter as well as the Talar (robe) were an imitation of the garb of the Protestant clergyman never occurred to us” (“Rabbi in Two Continents”, Tradition, Transition and Transmission, ed. Brian D Fox, 1983, p. 115). Yet not all rabbis in Germany had liked wearing robes. Rabbi Joachim Prinz had “great contempt for artificial solemnity and formal dress, even for the kind that the liberal rabbis used to wear” (Joachim Prinz, Rebellious Rabbi: An Autobiography, ed. Michael A Meyer, 2008, p. 72). British Sephardi clergy wear canonicals with top hats instead of birettas. Previously, tricorn hats were worn over a hairpiece. It is said that one summer in the 19th century a chazan at Bevis Marks felt hot, removed his wig, found his tricorn no longer fitted, and officiated in the top hat he wore in the street, thus creating a new custom. Sephardi chazanim in Amsterdam and elsewhere retained the tricorn. British Hahamim all seem to have worn robes, as on the Continent: an example is seen in the portrait of David Nieto (Haham 1701-28) at the Jewish Theological Seminary of America. It is not certain whether these were an echo of Christian ecclesiastical wear or a style specially developed for or by rabbis. Reform and liberal ministers also wore canonicals until recently. The founder of the British liberal movement, the Hon. Lily H Montagu, officiated as lay minister of the West Central Liberal congregation in London – the first woman to occupy a pulpit in Anglo-Jewry – in a classical cap and gown, though she had no official ministerial title or qualifications. The term “canonicals” is from a Greek word for a rule and denotes a Christian decree; canonicals are vestments prescribed by church law. Rabbinical dress codes were never laid down by halachah, though westernised communities used malbushim (“garments”), possibly because post-Emancipation Judaism turned spiritual leaders into ritual functionaries. In medieval Europe, dress codes (including neck bands) came into the law and academia as a mark of social status. Jews who entered these professions adopted the dress code, but in more recent times it raised halachic questions, e.g. whether a kippah (skullcap) was needed on top of a lawyer’s wig. In the Nieto portrait the rabbi has a full wig and no sign of other headgear, though he probably wore a hat over the wig whilst at prayer. Laymen and clergy wore street hats – often top hats – in the synagogue. Rev. Samuel Marcus Gollancz of the Hambro’ Synagogue is shown in his Biographical Sketches (ed. Hermann Gollancz, 1930) wearing a top hat with his black robe. Chief Rabbi Solomon Hirschell wore a high fur hat and later a tricorn. His successor, Nathan Marcus Adler, wore something like a biretta, probably based on a German doctoral cap. Some clergy continued to wear top hats with their robes; a picture of the Central Synagogue marriage of Leopold de Rothschild and Mlle Marie Perugia in 1881 shows the officiants with top hats. Even shammasim wore top hats and gowns. 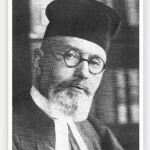 From the early 20th century Ashkenazi ministers tended to wear a Roman clerical collar in synagogue and street (“Roman” does not indicate Catholic origins; the collar has no theological significance). In the street they wore a flat clerical hat, later replaced by a Homburg or Borsalino. Some say that preaching bands represent the tablets of the Ten Commandments, but such bands are found in all professional groups and may be a stage in the development of the cravat. The bands were sometimes broad, sometimes narrow, sometimes plain, sometimes embroidered. Ministerial vestments are sometimes called chukkat ha-goy, gentile usage. They were banned in the Mahzikei HaDath Synagogue in London because they seemed an “imitation of non-Jewish Clergy” (Bernard Homa, A Fortress in Anglo-Jewry, 1953, p. 110). Actually there were blue priestly robes in the Temple (Ex. 39:22), not black, which was an unpleasant colour (Yoma 19a; BK 59a). A talmid chacham (scholar) had to have clean, respectable garments (Shab. 114a; Maimonides, Hilchot De’ot 5). However, he was not a professional rabbi in the modern sense; and the rules about his garb apply at all times, not just at services. Neither rabbis nor chazanim had special garments for the synagogue other than the normal prayer robe (tallit) (Num. 15:38), but some rabbis had largish caps. Anglo-Jewish clergy were not particular about covering their heads at home, other than during prayers. In the street, like most males, they wore a hat. Even at ministerial conferences many were bare-headed. A 1930s photo of British chazanim shows only ten out of 39 with visible headcovering; 29 have clerical collars. Hardly anyone covered their heads at communal meetings: some people would hurriedly put their hand on their head if they wanted to use a Hebrew word or phrase. Eastern European pietists – laymen as well as rabbis – adopted special garb which echoed gentile sartorial styles, though this usage was not limited to times of worship. Sephardi rabbis (especially the Turkish chacham bashi) adopted a distinctive garb, generally mimicking the Ottoman environment, but this too was not restricted to synagogue worship. The Rishon L’Tziyyon (the Sephardi chief rabbi of Israel) still wears colourful robes of this genre. In British Jewry canonicals were more or less universal in “establishment” orthodoxy and reform from the late 19th century. Amongst the strictly orthodox the chazan and shammas, but not the rabbi, often wore a canonical-like cap without the gown. 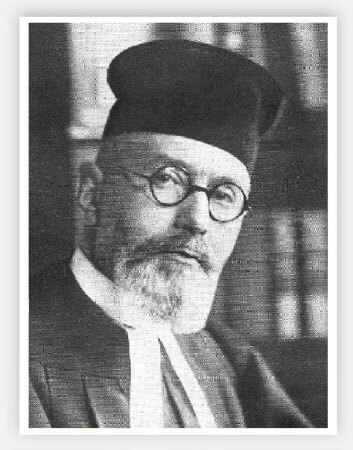 When Rabbi Israel Joseph Lew, a scion of Gerer chassidim, became minister of the Mile End and Bow Synagogue in the 1920s, he wore a frock-coat instead of canonicals. Generally, however, an establishment minister seen without his robes was “regimentally undressed”. Congregants took canonicals for granted and said, “It gives the service dignity” and “This way you know who is a rabbi”. There were no distinctions of rank or canonicals between British ministers, though the chief rabbi had dark blue vestments instead of black. Some but not all the dayyanim of the London Beth Din wore canonicals when officiating in an establishment synagogue. Canonicals have been gradually abandoned. First the clerical collar went and the preacher’s bands were dropped. Then canonicals ceased to be used at funerals, tombstone consecrations, and weddings, and finally they disappeared altogether. Even “cathedral” synagogues now admit that services can be dignified and rabbis identified without special garb. There is a trace of canonicals in the High Holyday white kittel (though this is not limited to officiants). Some cantors still wear chazanic caps, often with pom-poms, but this may be for theatrical reasons. It must be said that the styles currently favoured by some strictly orthodox rabbis and their followers are no more “Jewish” than the now discarded canonicals, since frock-coats and kapotes (caftans) reflect a bygone gentile era. At civic events I long ago abandoned canonicals and wore a large tallit, but I continued with a cap and gown in the synagogue. I recall my excitement at being able to order my first canonicals from Ede and Ravenscroft in London, though certain colleagues feared that the gowns contained sha’atnez, a prohibited mixture of wool and linen (Lev. 19:19, Deut. 22:11). These robes never had any real religious significance, though priestly garments were worn in the Temple as a mark of professional dignity. Sartorial mores are now weakening everywhere, and many Christian clergy prefer mufti. Outside the Roman Catholic Church the clerical collar is rare. Even robes are disappearing, at least amongst the Protestants. Few churches would now describe their rector as dressed “like the Queen of the May”. Amongst Jews, outward appearance is not unimportant, but not in the earlier sense of special rabbinical costume for the synagogue. Halachically observant males increasingly tend to have their tzitzit (fringes) outside their clothes. They tend to grow a beard and keep their heads covered at all times, often with a kippah underneath a black hat, but these styles are not limited to rabbis or to the synagogue. Orthodox women wear modest clothing as a mark of dat yehudit (“the Jewish rule”: Mishnah Ketubot 7:6) and keep their hair covered by a kerchief, hat or sheitel (wig). They have no female rabbis or cantors, though there are women Talmudists, scholars, teachers and mentors. Non-orthodox women rabbis and cantors are generally not interested in halachic standards of modest dress or head-covering. Some don kippot, but it would be unlikely for them to follow Lily Montagu and wear a cap and gown. In the synagogue the modern rabbi – of all types – prefers to be known for learning rather than livery; he rejects the concept of the minister as a ritual functionary and prefers to be the teacher and guide of his community. In British countries top hats and formal wear were maintained until recently by synagogal honorary officers when “on duty”, but this formality has almost completely disappeared. Traditionalists are aghast when they occasionally see an honorary officer wearing a sports jacket whilst in “the box”, the special pew for honorary officers, and seeing an honorary officer in an open-necked shirt almost has cardiac consequences. In Israel the weather conditions in summer, justify an informal style of dress, but I still wear a suit and tie. When some people used to attend my Sabbath services in Australia in shorts and thongs, I objected that relaxed dress standards can go too far, but in Israel I make no comment. This entry is filed under Articles, Australian Jewry, British Jewry, History.